Do you have problems with your jaw joint? Headaches and migraines got you down? Does your jaw pop and lock when you chew, bite or open your mouth? These are common symptoms of a TMJ disorder. During a consultation with Dr. Ducasse, he will evaluate your symptoms, arrive at a diagnosis and suggest treatment options to alleviate the symptoms of TMD. The good news is that TMD is treatable. Relief is just a consultation away. Depending on the severity of teeth misalignment, you may require dental work to restore your bite, a Bite Splint, or you may require a mouth guard to prevent jaw clenching during sleep. Bite appliances are advised for people with bruxism, or teeth grinding during sleep. Bruxism can damage, chip or wear down teeth and fillings, as well as cause headaches. By having a custom made bite appliance made especially for bruxism, you can reduce the cumulative effects of its damage to your teeth. 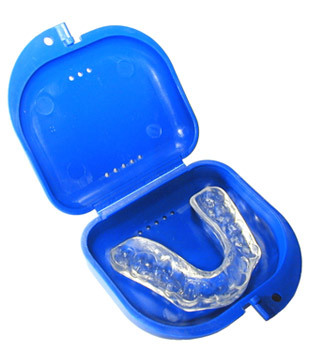 We are happy to assist you in custom making and fitting you with a bite appliance (nightguard) to protect your teeth. Contact us today for a consultation and to book an appointment with Dr. Ducasse.